The closer to him, the more ants underfoot. Some crawl to the ant-hill, others – from him. Many of something being dragged: blade of grass, a piece of pine needles, dried flake kidney. There are those that drag prey: flies, beetles, caterpillars. Sometimes a dozen ants swarmed caterpillar larger, and all are dragging it. “They help each other” – will tell anyone. Ants distinguish between his own and another’s nest. How are they doing? The smell of it distinguished by their foes. By smell, they find their way home to his ant-hill. Roads ant special: it is scented trails. Ants crawling on his trail. Sometimes ant trail winds and turns, twists in every way. And the ants, too, winding and circling, and not run straight. Why? The first ant ran this path, no paved roads. He just ran. On his trail ran through the other ant, and the third The ant is running on the trail, leaving a seq. Odor trail is becoming stronger, the road becomes more and more “traffic”. The closer to the anthill, the wider the road is straighter and the ant path. See the ants are very bad hearing they do not. They distinguish between the smell and taste. 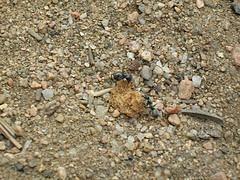 Destroying many harmful insects, the ants bring us a huge favor. Ants – are good defenders of trees and other plants from insect pests. It is estimated that the ant family, and lives in an anthill is always one family, collected over the summer about six million insects and their larvae.